Who needs tea when you can have something a little more explosive? Climb aboard a barrel of gunpowder and prepare for a ride that will bring a whole new spin to the traditional tea cup ride. 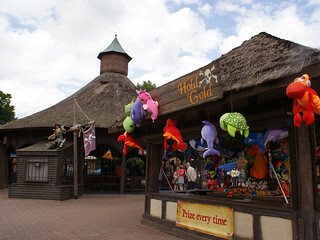 Sitting at the heart of Mutiny Bay, the imposing thatched structure of Marauder's Mayhem is hard to miss, especially when the menacing tones of Cap'n Black are barking instructions to riders or when smoke begins to ominously pour out of the gunpowder kegs at the centre of the ride. Once aboard, your fate is in your own hands as the wheel at the centre of each barrel allows you to control the spin of your own explosive ride. Be aware that nine of the twelve barrels run on a second turntable within the larger one, adding to the spin, so landlubbers who have yet to find their sea legs may want to use the other three. Marauder's Mayhem began its life at Alton Towers as a traditional style Tea Cup Ride. 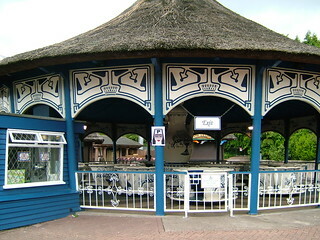 Opening in Aqualand in 1987 on the site of the original Park Railway station, the ride operated under a thatched canopy and featured twelve teacups and saucers revolving around a teapot centrepiece, all painted in a blue and white faux-porcelain style. When Aqualand was rethemed in 1994, the Tea Cups fitted perfectly into Merrie England and the ride continued to operate with few modifications for a further thirteen years until 2008, when the ride said goodbye to the brew and was totally rethemed to fit within Mutiny Bay.